Roses are actually easy to grow and should only be grown organically since they are one of the best medicinal and culinary herbs in the world. When they are loaded with toxic pesticides and other chemicals, this use is gone, or at least, it should be. Drinking rose hip tea or using rose petals in teas or salads sprayed with synthetic poisons is a really bad idea. For best results with roses of any kind, here's the organic program that really works. Buy and plant well-adapted roses for your area. Old roses will have the largest and most vitamin C filled hips. 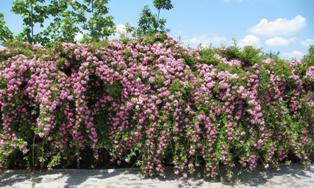 They are also the most fragrant and the best looking bushes for landscape use. However, any roses can be grown with this program. Prepare rose beds by mixing the following into existing soil to form a raised bed: 6” compost, ½” lava sand, ½” of decomposed granite, 20 lbs. of dry molasses, 20 lbs. of whole ground cornmeal, 30 lbs. zeolite and 20 lbs. of sul-po-mag per 1,000 sq. ft. Remove all the soil from the root balls and soak the bare roots in water with Garrett Juice Pro per label directions. Spread roots out radiating from the trunk and settle the soil around plants with water. For root stimulation, Garrett Juice Pro can be added to the soaking water or added when watering in the plants. Use the products at the same mixing rates used for spraying. After installing the plants, cover all the soil in the beds with ½ - 1 inch of compost or earthworm castings followed by 2 - 3" of shredded native tree trimmings mulch. Do not pile the mulch up on the stems of the roses. If possible, save and use rainwater for irrigation. If not, add one tablespoon of apple cider vinegar per gallon of water or Garrett Juice at half spray mix rate. Round #1: organic fertilizer or dry molasses @ 20 lbs. / 1,000 sq. ft., zeolite @ 40 lbs. / 1,000 sq. ft. and horticultural cornmeal at 10 - 20 lbs. / 1,000 sq. ft. Round #2: organic fertilizer @ 20 lbs. / 1,000 sq. ft., greensand @ 40 lbs. / 1,000 sq. ft., soft rock phosphate or Flora Stim at 30 lbs. / 1,000 sq. ft. Round #3: organic fertilizer such as alfalfa meal @ 20 lbs. / 1,000 sq. ft., and sul-po-mag @ 20 lbs. / 1,000 sq. ft. Apply dry granulated garlic to the soil. For insect pest and disease control in general, spray roses every 30 days with Garrett Juice and garlic tea or PureGro. For thrips, apply beneficial nematodes to the soil in early spring or when foliage begins to grow. For more information, read Texas Gardening –The Natural Way.